Not a single summer goes by without me thinking of the gorgeous Lonavali ice cream that is available in small family-run ice cream parlours in Ahmedabad. These parlours specialise in sort-of home-made ice creams, both common flavours like Kesar Pista and Chocolate and some highly uncommon ones, like Lonavali. Lonavali ice cream, as the name suggests, is a tribute to the famous chikkis of Lonavala. With a faint hint of rose, a gorgeous green colour, a generous dosing of pistachios, and bits and pieces of crunchy sesame brittle or chikki in it, Lonavali would make for a fabulous treat any time of the year. My friends and I would down cupfuls of this green beauty, especially in the hot summer months. Sadly, though, it has been ages since I had a cup of Lonavali – it isn’t available anywhere in Bangalore. I had been wanting to try out my own version of this ice cream, at home, since ages, but it kept being pushed to the back burner again and again and again. Finally, the experiment happened yesterday, and was a happy one at that. I managed to create an ice cream with sesame-and-jaggery brittle that was very, very close in taste to the Lonavali, and everyone at home loved it to bits. Coincidentally, yesterday was Ugadi, the Kannada new year day, when it is customary to consume ellu (sesame) and bella (jaggery). So, yay to that! I’ll be improvising on this recipe with time, but, for now, let me share with you the one that I used yesterday. 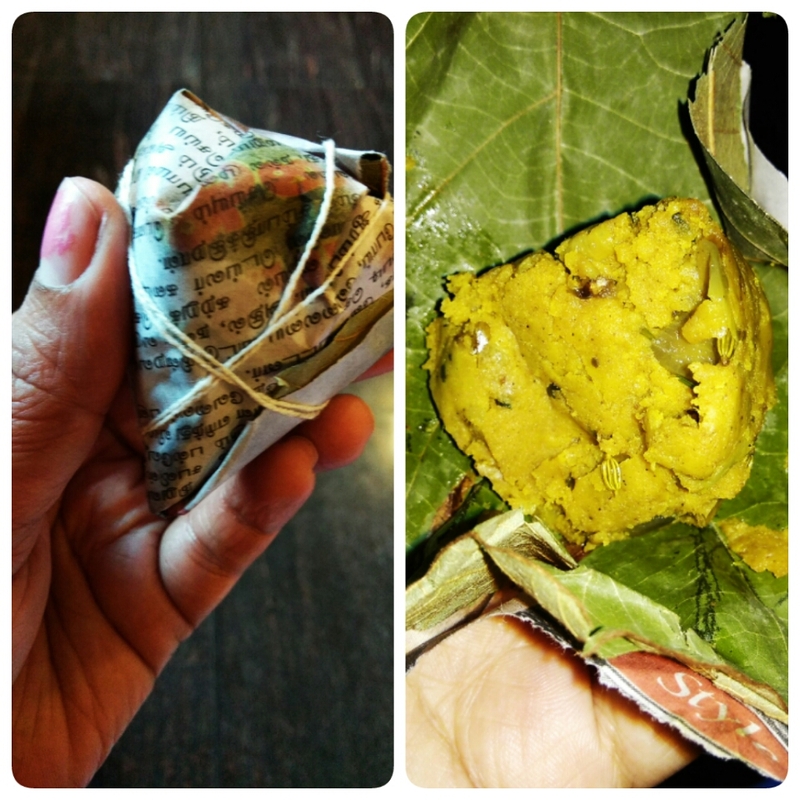 So, here’s presenting to you Lonavali aka Ellu Bella aka Tilgul ice cream! Lightly crush the revdi using a mortar and pestle. Do not make a fine powder, and let large-ish chunks of the revdi remain. You should get chunks of the revdi in your mouth as you eat this dish – that is the whole point of this ice cream! Keep aside. 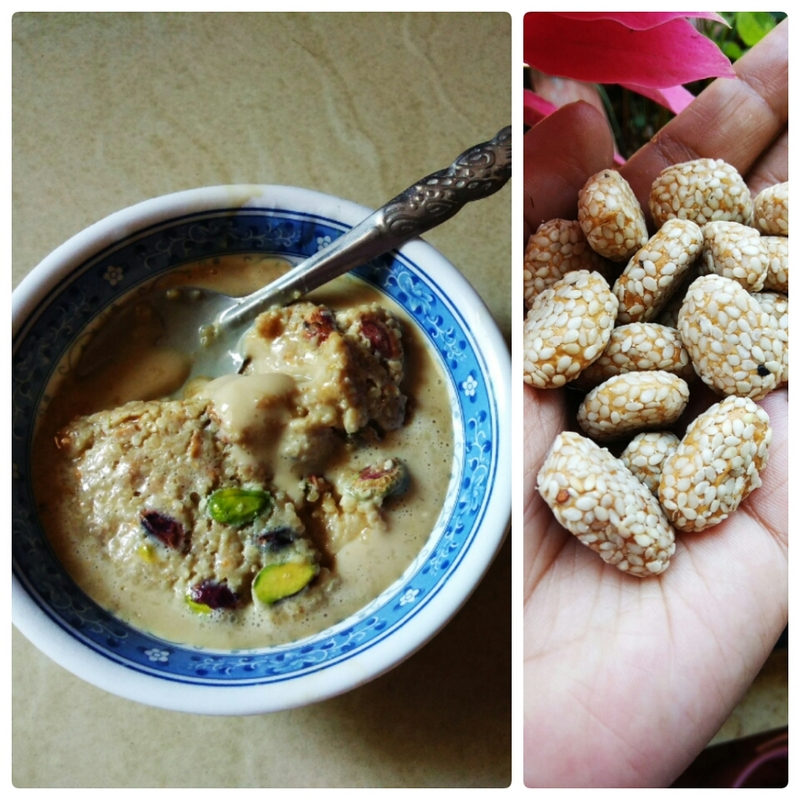 In a large mixing bowl, take the condensed milk, cream, salt, pistachios, rose essence, crushed revdi, and jaggery powder. Whisk well, until everything is well combined together. Transfer the mixture to an air-tight, clean, dry box. Put the box, closed, in the freezer compartment of your refrigerator. Freeze at maximum temperature for 3-4 hours or until the ice cream is set well. That’s it! I used fresh cream to create this dish, but you could use whipping cream, too. Whipping cream will give you creamier, richer ice cream. Adjust the quantity of jaggery that you use, as per your taste preferences. The jaggery will add a slightly salty undertone to the ice cream. If you are not okay with that, use sugar to taste instead. Alternatively, you could use a mix of jaggery and sugar. It is the jaggery and the revdi together that give this ice cream its lovely caramel colour. I used revdi to make this ice cream because of the hint of roses that they possess. I would strongly recommend using revdi, but if you don’t have them, you could use sesame chikki instead, too. The Lonavali ice cream in Ahmedabad makes use of sesame chikki, as far as I remember, so I used revdi with sesame too. You could make this recipe using peanut chikki or peanut brittle as well. This ice cream melts dreadfully fast, in a matter of seconds. It melted before I could bring a cupful of it from our kitchen to the living room, to take a picture! So, remove the box from the freezer only when you are ready to serve the ice cream. Add green food colour if you want, if you wish for the ice cream to look exactly like Lonavali from Ahmedabad. I skipped that, though. You like? I would love it if you could try out this recipe at home, and I hope you’ll love it too! Khichdi is my go-to food, whenever I am in need of some comfort, or when times are a little stressful. It is also the dish I turn to whenever I need to cook something warm and nutritious, but don’t have much time on hand. This particular khichdi – made with five types of lentils – is a big-time favourite in our household. To make this khichdi, I use those colourful packets of mixed lentils that are commonly available in most supermarkets – they are a mix of masoor daal, toor daal, chana daal, split black urad daal, and split green gram daal. These daals go by different names – mixed daal, panchmel and panchratan daal, for instance. Along with the lentils, I also use rice and whatever vegetables I have handy, in this khichdi. So, you can imagine just how packed with nutrition this dish is! It is quite flavourful too, and is extremely easy to put together. Served hot, with curd or a drizzle of ghee on top, this khichdi soothes the soul like nothing else. Here is how I make this khichdi. Grind these two ingredients into a paste in a mixer, using very little water. Keep handy. 1. Wash the rice and lentils under running water, a couple of times. Drain out all the excess water. Keep aside till it is time to use these ingredients. 2. Heat the ghee and/or oil in a pressure cooker bottom. I use a 5-litre pressure cooker to make this khichdi. 3. Add in the mustard. Allow to splutter. Add the asafoetida, cinnamon, cloves, bay leaves and cardamom. Let them stay in for a couple of seconds. 4. Now, add the chopped onion, beans, carrot and potato, along with the corn kernels and green peas. Add in the ginger-garlic paste. Saute for a minute. 5. Add the slit green chillies, as well as the washed and drained rice and lentils. Mix well. Saute for a minute. 6. Add 6 cups of water, the chopped tomatoes and coriander, turmeric powder, red chilli powder, salt, garam masala or chana masala, and sugar (if using). Mix well. 7. Taste the water, and add more seasonings, if required. 8. Close the pressure cooker when the water begins to boil. Put on the whistle. Allow to cook on high flame for 4 whistles, and switch off the gas. 9. Let the pressure come down naturally, before you open the cooker. Give the khichdi a stir before you serve it. 10. Serve hot with plain curd or raita or with ghee drizzled on top. 1. The little quantity of sugar that you add to this khichdi will not make it overly sweet. In fact, it helps in bringing out the flavours of the dish even more beautifully. 2. Increase or decrease the quantity of water, depending on how you want the consistency of the khichdi to be. This recipe yields khichdi that is soft, but not overly soggy, and is just right for us. 3. 4 whistles of the pressure cooker works just fine for us. Adjust the number of whistles depending on your family’s preferences. 4. You could use broken wheat (dalia) or brown rice for a healthier version of this khichdi, instead of ordinary rice. Alternatively, you could use basmati rice, too. Adjust the quantity of water that you use, accordingly. 5. I love using chana masala in this khichdi, sometimes, for a change, rather than garam masala. Using either masala makes for a tasty khichdi. 6. Use whatever vegetables you have on hand. I have listed out the veggies that I commonly used to make this khichdi. 7. Skip using the ginger-garlic paste, if you don’t want to use it. It adds to the flavour of the dish, but isn’t a must. 8. You could skip using the garam masala or chana masala, too. The khichdi will then be simple, but still delish. You like? I hope you will try this out too, and that you will love it as much as we do! Just last week, the happening locality of Koramangala in Bangalore saw the launch of a brand new restaurant. This restaurant, however, is very unique. It is different from the rest. In what way?, I hear you ask. Well, this place, Echoes, is different because it promises you a different sort of dining experience. Echoes, Koramangala, is fully managed by hearing- and speech-impaired staff. This includes the overall running of the outlet, except for the kitchen, as far as I understand. The same hearing- and speech-impaired staff serve customers as well. Noble thought behind the outlet, right? I was humbled to be a part of a bloggers’ table at Echoes, recently. This is Echoes’ second outlet. The first one, in Delhi, has had a really good innings. Echoes has a wonderful warm and friendly vibe to it. The decor is absolutely beautiful, there is no doubt about that. Brick walls, tastefully chosen knick-knacks, cosy nooks, a spacious sit-out, the smiling crew, the thoughtful quotes on the walls, the lovely motto on the T-shirts of the service staff – everything adds to the effect. It is clear that a whole lot of thought has gone into creating just the right sort of place and atmosphere at Echoes. I especially loved the way they have done up one of the walls entirely using kitchen utensils. Classy! Echoes has taken several steps to ensure a hassle-free ordering and dining experience for its patrons. Each dish on the menu, for instance, has a number alongside it, which is to be written down on a notepad when the service staff visits a table to take an order. (Each tubelight, fan and bulb here also has a number, to facilitate things for the staff – I loved the way they have paid attention to these little details!). Furthermore, each table is equipped with a calling bell, which will summon the service staff when pressed. The tables at Echoes also have a set of placards, each one containing a word that is commonly used in communication between the patrons of a restaurant and the wait staff – ‘Menu’ and ‘Plates’, for instance, or ‘Please get the manager’. Hold up the right card, get your word across to the service crew! Now, let’s move on to the grub we had at Echoes, shall we? Echoes has a mixed sort of menu – there’s a little bit of everything on it. There’s Italian, Mexican, Indian and Chinese, among other cuisines. The eatery serves both vegetarian and non-vegetarian food. Here’s a round-up of the food and drinks I sampled at Echoes. Raju Veg Tiffin Service: This was a beautifully presented dish, with papad, butter roti, and rice on a plate and two different kinds of gravies (butter paneer and rajma) served in an old-world tiffin carrier. I loved the taste of everything that was a part of this combo. The Raju Veg Tiffin Service at Echoes! Baked Cheesy Nachos: These were simply lovely! The sauce the nachos were served with were just the right amount of tangy, and the cheese was simply perfect. Rajma Galouti: I thought this was very ordinary. It seemed to lack flavour. Vegetarian Steamed and Tandoori Momos: Both the versions of momos lacked flavour, in my humble opinion. There’s definitely scope for improvement here. Stuffed Shrooms Tikka: This dish, again, was quite unexceptional. It felt quite bland. Paneer Makhani Pizza: This pizza had paneer as well as two other types of cheese, with a makhani-style gravy. It was quite average, nothing out of the ordinary in terms of taste. Makhani Pasta: This was something very new to me – penne pasta served with a paneer-butter-masala kind of sauce. Odd combination, probably, and maybe not meant for everyone, but I loved it to bits. I thought it was really well done. The lovely Makhani Pasta at Echoes! Milkshakes: Echoes has a whole lot of milkshakes for the chocolate-lover, with every conceivable flavour on offer – Oreo cookies, Snickers, Kit Kat, Black Forest, Ferrero Rocher.. you name it, they have it! We tried most of these chocolate-based milkshakes, and they were really very well done. Good job on this! My personal favourite milkshake, though, was the Red Rave, a red velvet cake-based shake that was mildly sweet, with bits of cake in it. Try out the milkshakes here, but don’t miss the amazing Red Rave, I say! Strawberry Lemonade: This was a beautiful, beautiful, beautiful drink, both in terms of taste and looks! The blend of sugar, strawberry and lemon was just perfect, making this a very refreshing thing to have. It sure didn’t have that ‘cough syrup’ taste that I have come across at a lot of other eateries, in case of strawberry-flavoured drinks. This is a must-have here, for sure. Virgin Mo: The Virgin Mo or mojito at Echoes was just perfect. It was very well executed, with the mint, sugar and lemon all perfectly balanced. Quite the salve for parched throats. This, again, is a must-have, as per me. The prices here seem to be slightly on the higher side, but not too exorbitant. A meal for two would set you back by about INR 1,000. I absolutely loved the time I spent at Echoes, Koramangala. The service staff seemed to be so put-together and well-organised, and all of them had a warm and welcoming smile on their faces. That said, I was here as part of a very formal set-up, so I am yet to experience the entire ‘service experience’ as such. I would definitely love to go back to this place, any time! The place seems to have quite a strong hold over Indian cuisine. We loved the Indian dishes here a whole lot more than the other fare. Likewise, the eatery is very, very strong with respect to its mocktails, juices and milkshakes. Every single one of the drinks we tasted here was beautifully done. I loved some of the food I sampled here, but was not overly impressed by some stuff. The place is very new, though, so it would only be fair to give them some time to gain a foothold. I would wait and watch as to how the food story here unfolds in the times to come. The ambience and decor here is absolutely amazing. Full marks to that. I would go back to this place just for the ambience, the service experience and the drinks! I was served this meal free of cost, along with a group of other food bloggers, in exchange for an honest review. The views expressed herein are entirely my own, not influenced by anything or anyone. Have you been to this place yet? I would definitely urge you to visit! The husband and I love our dosas, if you haven’t guessed that already. We often make a breakfast or dinner of dosas, and I can have them for lunch as well. To keep things interesting, I keep experimenting with different types of chutneys to serve with the dosas, as well as various fillings. 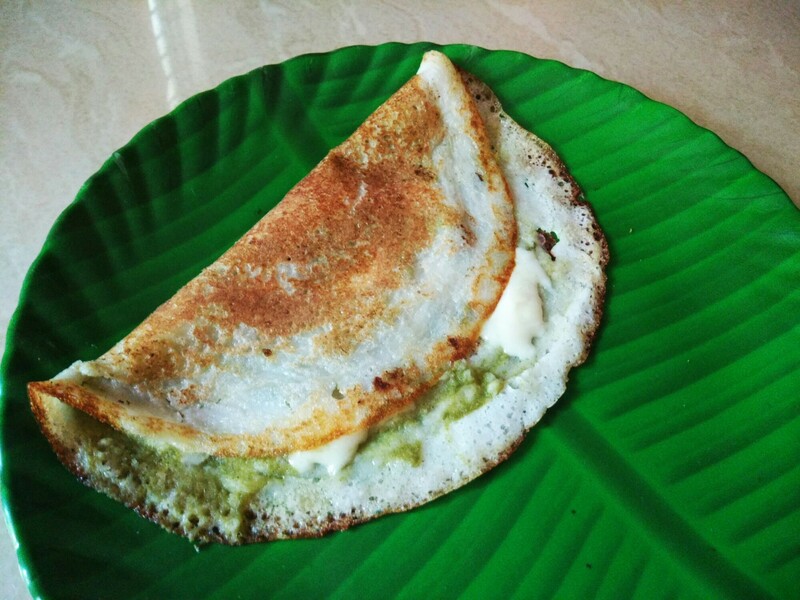 Lunch yesterday, for example, was cheese-chutney dosa, a simple but delish variation of the regular dosa. Here’s how I made these dosas. 1. Heat a dosa pan on high heat, till water droplets sprinkled on it dance. At this point, turn the flame down to medium. 2. Put a ladle of dosa batter in the centre of the pan, and spread it out. Keep the dosa slightly thick; do not make it too thin. 3. Spread a teaspoon of oil around the dosa. 4. Let the dosa cook on one side for about a minute, or until the side on top doesn’t look too raw and batter-y. 5. Spread about 1-1/2 tablespoons of the green chutney on the upper side of the dosa. Ensure that all sides of the dosa are evenly covered with the chutney. Spread out about half a cube of grated cheese, evenly, over the chutney. 6. Let cook for a couple of seconds more, without flipping the dosa over. The cheese will start melting by this time. 7. Now, fold the dosa into half, and transfer onto a plate. Serve immediately. This dosa doesn’t need any accompaniment. 8. Prepare all the dosas in a similar manner. 1. You could use any variety of cheese you want, to make this dosa. I am, however, partial to Amul processed cheese. 2. To make the spicy green chutney, I grind together a fistful of mint leaves, a fistful of coriander leaves, salt to taste, 5-6 green chillies (chopped), 5-6 garlic cloves (peeled), 1 small onion (peeled and chopped), a 1-inch piece of ginger (peeled and chopped), and the juice of 1 lemon with a little water. Store this chutney, refrigerated, in a clean and air-tight bottle and use as required. 3. The fresher the ingredients you use to make the chutney, the tastier it will be. 4. I use this same spicy green chutney to make ram laddoo and a variety of chaats. I use only a clean, dry spoon to use the chutney, and it stays well for up to 10 days, refrigerated. 5. If you want, you could spread some tomato ketchup inside each dosa, too, before serving. You like? I hope you will try out these dosas, too, and that you will love them as much as we do! When I made strawberry jam at home, I set into motion, inadvertently, an itch that just refuses to subside. Now, I want to make jam with every available thing! So far, I’ve tried my hands on making jam with fresh jalapeños and tomatoes – apart from strawberries, of course – and both experiments have yielded really good results. I absolutely love the flavour of the jalapeño jam, the mix of spice and sweet that it is. It makes for a beautiful spread for sandwiches, and its all-natural gorgeous green colour is captivating. I made the jalapeño jam in a slightly different way from the strawberry one. Here’s the recipe! 1. Wash the jalapeños and capsicum, and pat them dry. Ensure that absolutely no moisture remains on the vegetables. 2. Remove the stems from the jalapeños and chop them into medium-sized pieces. Similarly, remove the stem, seeds and white innards from the capsicum, and chop it into medium-sized pieces. 3. 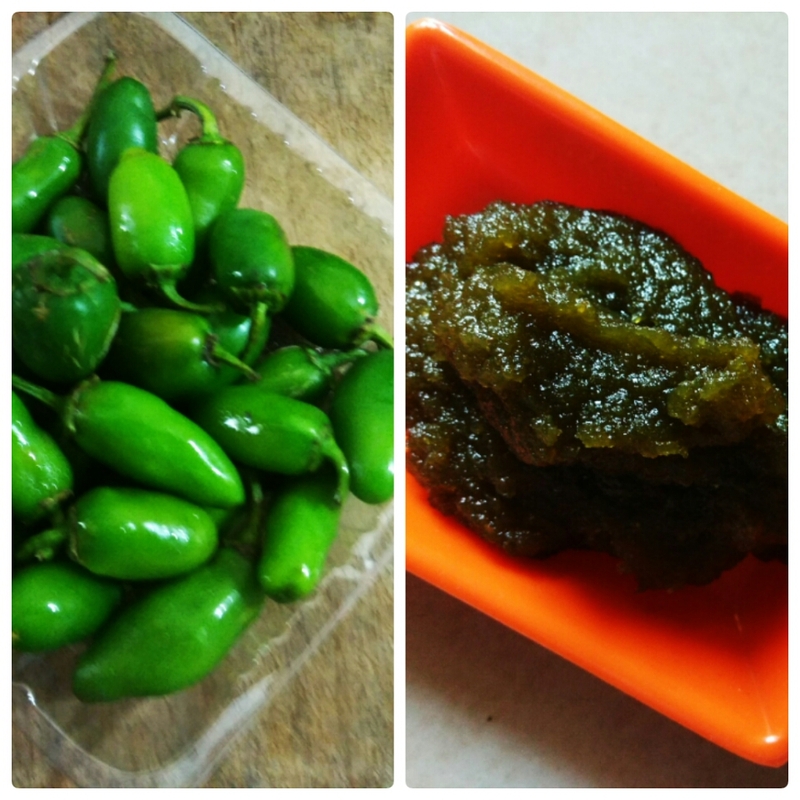 Grind the jalapeño and capsicum pieces into a puree, using a mixer. 4. Transfer the puree to a heavy-bottomed pan, and set it over a medium flame. Add the sugar and salt. 5. Keep cooking the puree over medium heat, uncovered, till it gets to a spreadable consistency. Stir intermittently, to ensure that the puree doesn’t stick to the bottom of the pan. 6. When the jam is thick, but still slightly liquid, switch off the gas. It will harden further on cooling. 7. Add the lemon juice at this stage. Mix well. Make sure all the ingredients are mixed together properly. 8. Allow the jam to cool completely, and then transfer to a clean, air-tight bottle. Keep refrigerated for a longer shelf life, using only a clean and dry spoon to remove the jam. 1. Increase or decrease the quantity of sugar you use, to suit your taste preferences. 2. The capsicum and lemon juice will help cut down the extreme spiciness of the jalapeños. Do not avoid using these two ingredients. 3. I did not remove the seeds from the jalapeños, and I got a jam that is mildly spicy. You could remove the seeds to cut down the spiciness of the jalapeños even further. 4. Cooking time might vary, depending on type of ingredients, gas stove and quantity of jam prepared. 5. Since this jam doesn’t contain any preservatives, it would be a good idea to use it sooner rather than later. You like? I hope you will try this out too, and that you will love it just as much as we did! I have always wanted to make jam at home, among some other packaged things that we often buy off departmental store shelves. It kept being pushed further and further on the back burner, till it got lost among all the chores of everyday life. Things changed yesterday, though, when I decided to, finally, get to make that jam, using the packet of strawberries that the husband had got just the day before. I set about to jam-making, after a bit of reading online about the process. Finally, I decided to follow this recipe, which sounded simple and free of fancy ingredients. In fact, this jam requires just two ingredients, can you believe it? It doesn’t call for pectin, either, which is a part of most jam recipes. I made a few changes to the original recipe – I used only two ingredients out of the four stated therein. I am so, so very happy with just how beautiful the strawberry jam turned out. The texture, the flavour, the colour are simply amazing! I am surprised by how very simple the jam was to make. Why didn’t I get to making it sooner?, I wonder. The best part is that it is completely free of preservatives and other chemicals. I’m not going to be buying jams off a departmental store shelf any more! Here’s how I made the jam. Wash the strawberries and pat them dry, using a cotton cloth. Ensure that no moisture remains on them. Remove the leaves and the thick stems from each of the strawberries. Chop each strawberry into four pieces. Place the chopped strawberries in a mixer jar, and puree them. Transfer the strawberry puree to a heavy-bottomed pan, and place it on a medium flame. Add the sugar to the pan. Cook the puree on medium flame, stirring every now and then, till it reaches a semi-solid state. Make sure the puree doesn’t stick to the bottom of the pan, and doesn’t burn either. Check for sweetness, and add more sugar if required. Switch off the gas when the jam is not fully solid, still a little liquid in consistency. It hardens further on cooling. It took about eight minutes in all, for me. Let the jam cool down fully, and then transfer it to a clean, air-tight bottle. Store refrigerated. Use only a clean, dry spoon to remove the jam from the bottle. You could choose to not blend the strawberry pieces into a fine puree, but keep some small chunks intact. I made a fine puree. You could also add a pinch of salt to the jam, when it is just about done, to enhance its flavour. I skipped doing this. If the strawberries you are using are quite sweet and not sour at all, you could reduce the quantity of sugar and add a little lemon juice to the jam when it is almost done. The strawberries I used were nice and tart, so I skipped adding the lemon juice. I got only about 5-6 tablespoons of jam by using 12 medium-sized strawberries. Increase the quantity of the ingredients proportionately, if you intend to make more jam. There are no preservatives added to this jam, so it is best to keep it refrigerated and use it as soon as you can. Any fruit can be used to make jam, in a similar way. You like? I hope you will try this out at home, too! Making pasta Indian-style is something that I resisted for the longest ever time. Some things are best left untampered, I thought, like pasta, which is best made Italian-style. Indian spices just wouldn’t go with pasta, I told myself. Yesterday, though, something changed. I had had a packet of rice fusilli pasta lying around in my kitchen unused, and I decided to make a very Indian pasta stir-fry for dinner. I probably wanted to check whether the dish I came up with would strengthen my pre-conceived notions or demolish them. I went all out, with lemon, coriander, chaat masala, chana masala, red chilli and turmeric powder. The end result was delish – in fact, so delish that I think this is going to be a regular at our table now onwards. I now understand why Indian-style pasta is such a favourite among bloggers, among adults and kids alike. Here is how I made the pasta stir-fry. Take the pasta in a heavy-bottomed pan. Add just enough water to submerge the pasta, a little salt and a tablespoon of oil. Set the pan, uncovered, on a high flame. When the water reaches boiling point, turn down the flame to medium. Cook till the pasta is al dente. Do not overcook the pasta, otherwise the dish will turn into a soggy, tasteless mess. When the pasta is cooked al dente, place a colander in the sink and transfer all the contents of the pan to it. Run cold water over the pasta, to stop further cooking. Set the colander aside and let all the water drain out. Heat the 2 fingers of butter in the same pan you used earlier. Add the chopped onion, carrot, peas and beans. Turn the flame down to medium, and add the turmeric powder and salt and red chilli powder to taste. Cook till the vegetables are cooked, but not overly so. Sprinkle a little water as and when needed and stir intermittently, to ensure that the vegetables do not stick to the bottom of the pan. When the veggies are cooked just right, add the cooked pasta, along with the slit green chillies, chaat masala and chana masala. Mix well. Cook on medium flame till the raw smell of the masalas disappears. Keep stirring intermittently, to avoid sticking to the bottom of the pan. Stir gently, making sure the pasta doesn’t break. When the pasta is done, switch off the gas. Add the chopped coriander, lemon juice to taste and tomato ketchup. Mix well. You could add in some chopped garlic along with the veggies too. I avoided that because I was using garlic butter. You could use garam masala instead of chana masala, too. I like the flavour of chana masala better than garam masala, so I used the former. Add in any other vegetables that you want to. I added the vegetables that I had handy in my refrigerator. You could use plain, salted butter in place of garlic butter, too. Garlic butter gives the dish a lovely flavour, though, so I would highly recommend using it. We like a slight tang in our food, but if you don’t, skip the lemon juice. Have you, too, like me, hesitated over making pasta the Indian way? Please don’t! It is definitely tasty – I can vouch for that. Do try out this recipe to start with, and let me know how you liked it! How do you make Indian-style pasta at home? Do share!